The Hofner Ignition Violin electric bass guitar in sunburst continues the fine tradition of crafting precision string instruments. Taking notes from their own 70s Violin Bass models, the Ignition is a fully hollowbody masterpiece, making the iconic model affordable so that many more musicians can get their hands on this coveted model. Built using on the finest tonewoods and equipped with superb appointments, this is a chance not to be missed - and if it’s good enough for Sir Paul McCartney, then surely it’s good enough for you. The distinct double bass tone produced by the Ignition is thanks to the splendid architecture of its hollowbody design. The back and sides are crafted using flame maple, whilst the top is made using spruce. These highly resonant tonewoods generate incredible energy, which is contained within the chambered body and then translated exquisitely by the pickups. The top, back and sides have all been given a white binding to add protection against buckling or warping. A small pearloid plastic pickguard protects the body top across the lower bout from unwanted pick scrapes, or damage. The sunburst paint job, gives the bass an authentic finish. Fitted to the body is a slender maple/beech/maple neck. Paired with the neck is a 22-fret rosewood fingerboard, which is decorated with dot position inlays to aid in your navigation. The unique Hofner headstock is home to the single-nickel tuners with pearl-finish buttons, which carry out the task of maintaining tuning integrity meticulously. The Ignition electric bass is equipped with a pair of Hofner Ignition Staple Nickel pickups - fitted in the neck and bridge positions. The Hofner control panel gives you detailed control over your sonic output - with a master volume pot, a master tone pot, and individual on/off switches for each pickup -, enabling you to readily switch between tight high-end tones, creamy saturated mids, and rumbling lows. 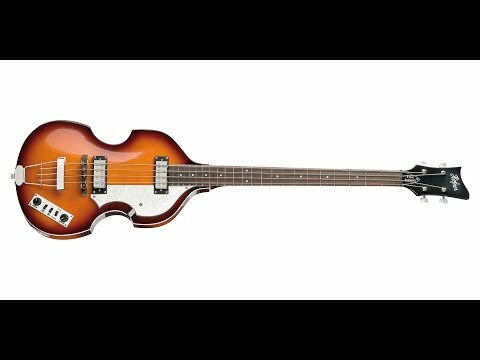 The Hofner Ignition Violin electric bass is a timeless classic that is available to the musicians of today, and is bursting with all the features of the original but at a price to suit all budgets. Posted on 01/10/2015 by Scotty I had a shot on this in store and I can honestly say for such a great price this bass is fantastic!